The leading evangelist of our time, Billy Graham exerted tremendous influence on American religious life and, to a lesser extent, on the political landscape of the United States. He preached all over the country and in a number of overseas venues. The Graham organization contributed in many ways to the breakdown of racial barriers. His associations with U.S. presidents and other prominent political leaders were controversial. Above all, Billy Graham stood as a shining light of integrity. William Martin is an emeritus faculty member at Rice University and directs two programs in religion and public policy. Martin has written extensively on evangelical and fundamentalist religion for both religious and secular venues. He published an earlier version of this work in 1991. With the earlier biography as a foundation, the present work benefits greatly from materials kindly provided by the Graham family. Martin had access to extensive correspondence with Graham, as well as interviews and previously unavailable documents from the Billy Graham Evangelistic Association archives and resources from six presidential libraries. The result is an almost overwhelmingly detailed picture of Billy graham and his activities for well over seven decades. The book opens with a chapter tracing the history of American revivalism in all its forms from the time of the Revolutionary War through the many facets of formal and informal church activities of the 19th century and leading us to the early 20th and Billy Graham. A number of well-known preachers of those times are mentioned, including John Cotton, George Whitfield, James McGready, Charles Finney, D. L. Moody, and Billy Sunday. The period was characterized by both upswings of revival and downswings of doubt and discouragement. Through all this change, the stage was being set for the most impactful preacher of the 20th century: Billy Graham. Martin divides the story of Grahams’ life into five pivotal sections. This is not simply a repetitive history of crusades and sermons, but an exploration of key periods in Graham’s life, including journeys through some of the controversial issues seen in twentieth-century America. One area of division that Graham had to confront was race. Segregation was a way of life throughout much of the South (and was also seen in more of the North than many would admit). Graham early on had “integrated” crusades, although seating was still segregated in most places. However, he eventually became more bold in his practices: for example, he removed the ropes separating white and black seating at his 1953 Chattanooga crusade. Graham appointed blacks as leaders on his Crusade team and invited Martin Luther King, Jr. to join him on the platform and lead the opening prayer at his Madison Square Garden crusade. These steps led produced strong opposition to his ministry short-term, but produced long-term benefits in the end. Graham was associated in one way or another with at least 12 U.S. presidents. Perhaps the most controversial relationship was with Richard Nixon. Although Graham certainly did not endorse Nixon’s politics or ethics, he many times provided prayers and counsel. His associations with the president were controversial, especially with regard to Vietnam and Watergate, two defining phenomena of the Nixon years. Unlike many other evangelists (“tele-“ and otherwise), Graham has always maintained careful boundaries with regard to both money and staff. His board of directors determines all financial aspects of the ministry, including Graham’s salary. Strong controls are in place to maintain integrity in relationships to avoid the situations that led to the downfall of Jimmy Swaggart, Jim Bakker, and others. 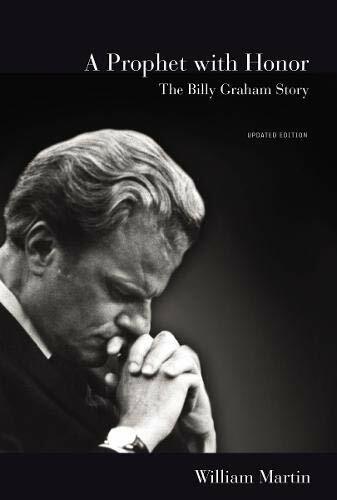 One of the strengths of this book is Martin’s willingness to show Billy Graham as a real person, not some sort of plaster saint. Throughout his life, Graham dealt with some major decisions, such as those dealing with race and politics. Because of his access to key documents and individuals, Martin can provide an honest picture of the struggles that Graham had as he sought to do the right thing. A Prophet with Honor is an in-depth, honest, and absorbing story of the life of Billy Graham. Other books have been written and are being written about this man (including a very recent work by his son Franklin Graham), but this book will serve as the primary source to which people turn for decades to come.